Dr. Julie Akers teaches on the topics of health care systems and pathiophysiology, and serves as a preceptor for introductory pharmacy practice experiences (IPPEs). How contributions of community pharmacists through providing medication management services to patients can have a positive influence on the transistion of care for patients from the hospital to home, and reduce hospital readmission due to an adverse drug event. Human Papilloma Virus education and prevention. 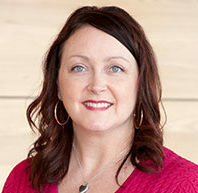 Akers began her clinical practice in pharmacy as a pharmacy technician and intern at Shopko, and then moved up from pharmacist at Bartell Drugs to pharmacy manager and then pharmacy district manager over a span of about 10 years. She then worked for the Everett Clinic in Everett, Wash., as the retail pharmacies manager. Akers served on the WSU College of Pharmacy Dean’s Advisory Board from 2009 to 2013, at which time she joined the College faculty. Akers is a past president of the Washington State Pharmacy Association, and has twice been selected as a delegate to APhA representing the State of Washington. Application of pharmacy knowledge in a clinical practice setting, pharmacy law and regulation as well as pharmacy management.